Weddings are usually a collaborative effort and your family and friends will be there for you as you make tough decisions and will also be a shoulder to cry on if you get stressed. Showing your appreciation through a small gift on your wedding day is a kind gesture. We have put together our favorite personalized wedding gifts even the pickiest people (dads) will love! As you go through stress, face challenges, and have a few bridezilla moments, your bridesmaids will stick with you through it all. Customizing something special for them will show them that you care even though at times stress can get the best of you. Champagne glasses or tumblers can be personalized with your bridesmaid's names, the wedding date, or even a fun saying. Matching satin robes can also be used as a photo op and can be embroidered to say "Bridesmaid." You can get in on the fun with a white "Bride" robe. These customized cups can be found on etsy. The father and daughter bond is very special and the majority of brides choose to walk down the aisle with their father. Dad's are usually hard to buy for because they only like things that are useful. With a customized tie, you get a two for one deal. Your dad will have a tie to wear on your special day but it will also be meaningful and signify your chanigng relationship. You can order a customized tie patch from etsy here. Jewelry makes a great gift for moms because it's meaningful and signifies this special moment in time. Whether your mom likes necklaces, earrings, or bracelets, you can purchase what she likes and customize the jewelry box to include one of your favorite quotes. 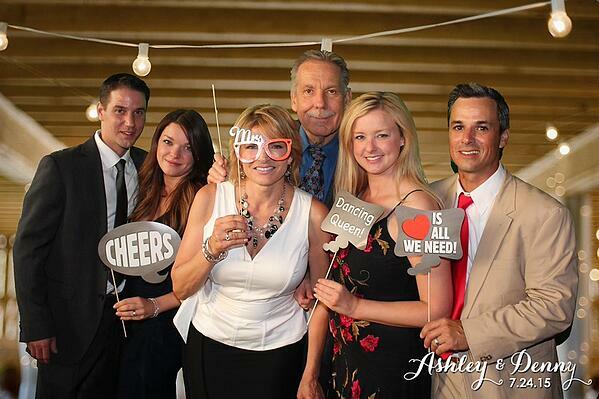 Get everyone in on the fun by adding a photo booth to your big day! TapSnap's photo booths can be customized to include your wedding theme, colors, date, and names. We also offer a variety of additional features including animated GIFs, custom green screens, and digital props. With unlimited high quality prints and social sharing, your guests will remember your special day forever! If you're interested in adding a photo booth to your big day, you can find out more about our features here or check your date below!